Yury Feygin likes playing with pianos — so much, in fact, that he occasionally forgets to eat and sleep. 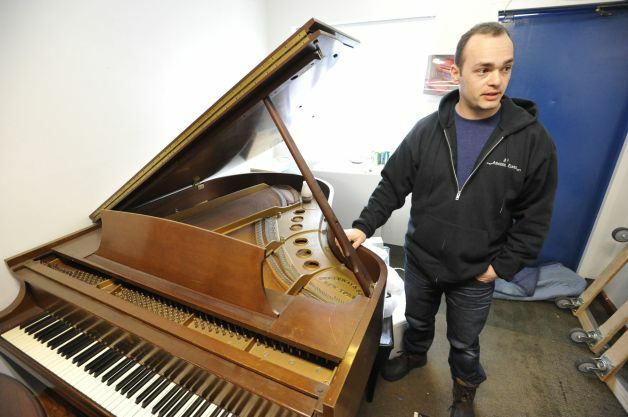 Like his father, Mikhail, and grandfather, Semyon, Feygin is an expert at restoring, tuning and repairing antique pianos. Feygin and his workers have built a first-of-its-kind double-decker storage system at their Lenox Avenue warehouse. They have stashed dozens of pianos in the racks, legs removed, filed side-by-side like massive dominos as they await restoration. This entry was posted in Pianists, Pianos and tagged antique piano sales, moving, piano, piano store, repairs, restoration, Steinway & Sons, storage, tuning. Bookmark the permalink. Wow so cool! We do a lot of the same things at Highland Piano Studios!